I was surfing on the internets and somebody’s site had an ad for a Fabreeze Wood Wick candle. Wha? I clicked on it, and saw that it’s a real piece of wood jammed into some wax. You light it and according to the spokeslady on the video, it smooths away your wrinkles, makes your house beautiful, and sounds like a crackling fire! I immediately thought: I gotta make that. 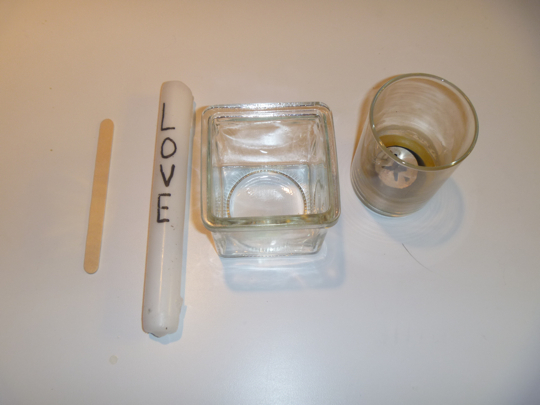 The cast of characters: A craft stick, and old Advent wreath candle from last year (I write the words on them for the kids), a jar, and some old good-smelling wax to throw in. 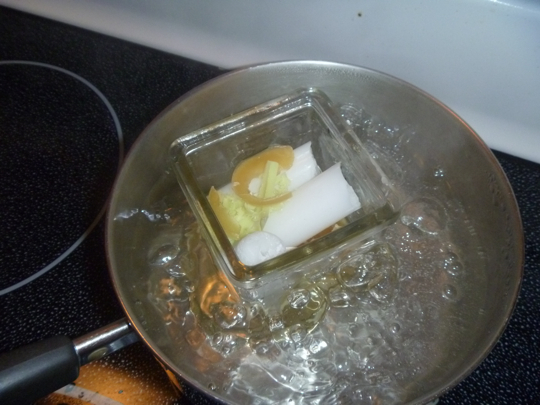 I set a pot of water t’boilin’, and broke up the candles into the jar. It was a woefully small amount of wax, so the Joy candle and a few tealights had to go in, too. Boil boil boil, melt melt melt. Narrowly avoiding some nasty burns, I took out the jar and inserted half of a craft stick (pre-dipped in wax to be more wick-like). Several things went wrong here, but let’s just say I went through a couple of craft sticks and leave it at that, shall we? I’d like to point out that I didn’t completely melt the candles, and that was cool because they held up my wick. Next I went to the computer to look up how to do this. Apparently you’re supposed to use a hardwood wick like ash or walnut – pffft. You’re also supposed to let the candle cool for 24 hours before you light it. Double pfffft. I don’t have that kinda time. Finally I lit it, but realized that the wax had shrunk and now the wick was too tall. The how-to website said you could buy a wick trimmer. I assume they meant wire clippers, which is what I have. The verdict? Well, if you turn the t.v. off and are very, very quiet – yes, you can hear a little crackling. Also, the occasional tiny spark flies off of it, which adds an element of danger to an otherwise boring candle burning, so there’s that. All in all, it was an experiment involving fire, so I’m happy. Another prototype and the house is not burnt down. Success! After so many mishaps, I’m impressed that you stuck with the project to the end. Way to go! Our grandfather the tinkerer would be very proud. You just made my day…and probably save my life. I buy scented candles in nice glass jars then after a while I dig out whats left of the candle wax, put it in a coffee can, and use the jars to store spices and stuff in. I wanted to try making new candles out of these “chunks” and my first thought was to use some of the 5000 wooden crafts sticks that have been sitting in my crafts closet for years. Anyway I’ve spent hours trying to find out if craft sticks would work. Every website says to purchase “treated” wood wicks. Now since I’m cheap (and crazy) I thought “screw that, ‘treated probably means its soaked in something like lighter fluid so it will burn easier” I was just about to soak some craft sticks in lighter fluid and give it a shot when I found your site. Oh my gosh! Your writing style is hilarious! You remind me of me, lol!!! (And I used to be a teacher to…hmmm….) Not many times I read something and laugh out loud with delight. Good job, you. Thanks, Eve! 🙂 Here’s to fellow teachers! I saw someone had soaked the sticks in olive oil. Did the craft stick work for the whole candle? 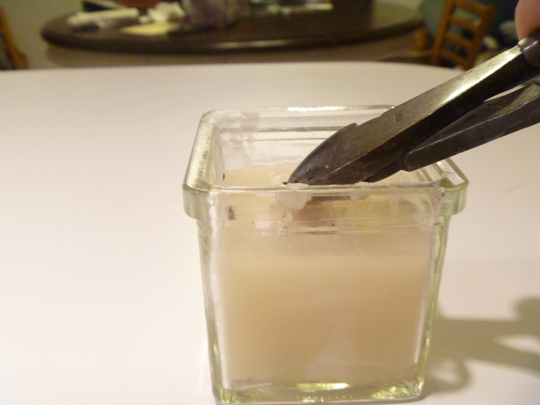 Also, to those of you who save the “chunks” of wax from old candles to re-use the jars, pour boiling water into the jar and just let it sit overnight or until cool. The wax all bubbles up like a lava lamp (pretty fun to watch the first time!) 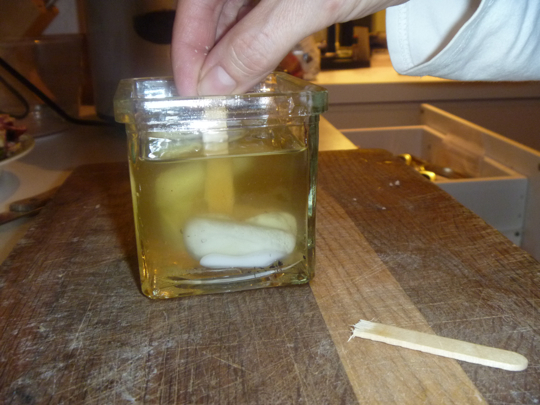 and cools very nicely at the top to just pop out and leaves a virtually wax-free jar!! So much easier than digging it out! Every once in a while, a stubborn jar will require it to be done twice if you want it really clean. Hi, Janel! I’ve done this a couple more times since then, and yes, I just soaked the sticks in cooking oil. It works very well. Good to hear from you, Jerry! Good scientic research takes time, meticulous preparation and dedication, unfortunately, I lost my round tuit this spring as well as dealing with some other issues that screwed everything up:)! I got around to firing up the melting pots and cast 2 new 5 inch coach candles from my Pourette molds, both with wood wicks, I split the wicks to about 1/4 inch. One candle was pure beeswax, the other hard candle wax. 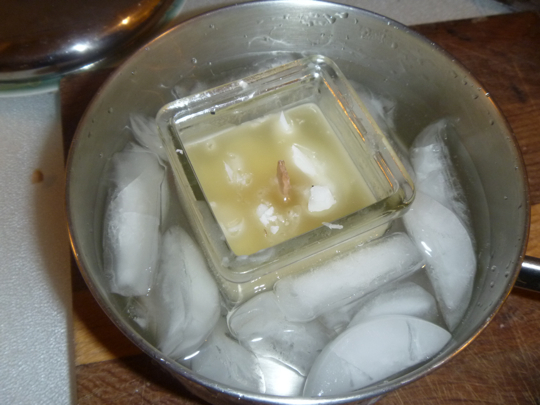 I also used a square braid(I think) beeswax candle as my control. All 3 were measured and marked 1 inch down the barrel from the “bell” top and placed onto candle lanterns, that I use for primitive camping and lit outdoors in fairly calm conditions. The lanterns are not identical, since I don’t happen to have 3identical lanterns:)! The timer was electronic, as in my microwave oven. Candles were checked about every 5 minutes or so. 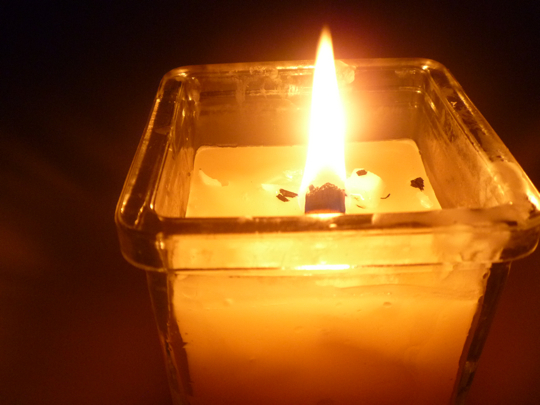 At 30 minutes, both wood wick candles had burned to or very near the 1inch mark, while the braided wick control candle had not burned into the barrel of the candle. The test was concluded at this time. My conclusion is that I will stay with braide wicks for my coach candles and maybe try the wood in a bigger pillar or container. Wood wicks burn way too fast for the coach candles. You are my hero…nothing stops you. I’ll be back. This was a hoot! still laughing! Just loved it and thanks for the investigative work -- good job!